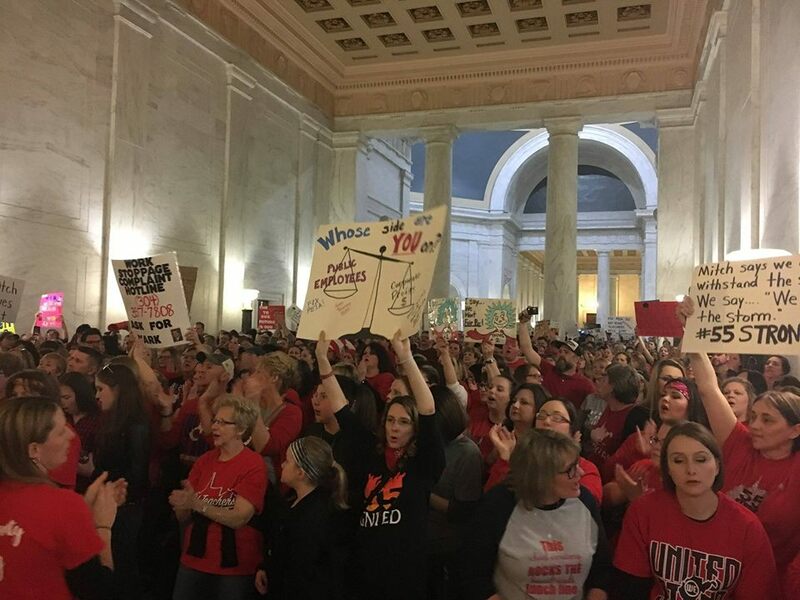 After over a week of protests and statewide strikes, West Virginia teachers returned to the Statehouse this Saturday to continue demanding higher wages and an end to skyrocketing health insurance costs. Socialist Alternative members joined with striking educators at the statehouse in Charleston. Across all 55 state school districts in WV, teachers have sustained a statewide strike since Thursday, February 22 and remain committed to continuing with strikes until state legislators concede a 5% pay increase. Teachers across all districts pushed forward with strikes last week despite calls from the state union leadership to return to work after Governor Jim Justice’s promises of a 5% pay increase on Tuesday evening. Carol Roskos, an elementary school music education teacher and union member, recalled, “Our union leaders said, you all can go back to work on Thursday and we thought, ‘are we really just going back to work on just a promise?’ People were angry.” The mood on Saturday afternoon shifted as groups of union members gathered to watch finance committee and Senate proceedings after an energetic rally of public employees at the statehouse Saturday morning. While educators across West Virginia have affirmed their commitment to strike until their demands are met, other unions in West Virginia and across the country are preparing escalating actions of their own. Oklahoma teachers are currently planning a statewide strike in the fight for higher wages. CWA communication workers at Frontier Communications in West Virginia began to strike at midnight, Saturday night, following hundreds of layoffs and increased use of contractors to cut jobs. The effectiveness of the strike tactic has been clearly demonstrated with the West Virginia teachers – they have already defeated the miserable initial 1% offering. With the continuation of the strike and occupation, supported by an outpouring of solidarity from around the country, so much more can be won. Socialist Alternative stands in solidarity with all striking workers fighting for better pay, benefits, and working conditions.